Professor John Anderson and Shaun McCarthy were part of a team of researchers who recently completed a pilot project to improve screening and intervention through a health-legal collaboration as part of the broader ‘Action on Elder Abuse” research work. This pilot project was funded by a grant from the NSW Department of Family and Community Service (Ageing and Disability Commission). It brought together health and legal service providers in the Newcastle/Hunter region to design and pilot test an intervention to support elder abuse screening for community-dwelling older adults and the use of referral pathways for timely and effective action to address suspected situations of abuse. A major outcome of this pilot project is Identifying and Acting on Elder Abuse: A Toolkit for Legal Practitioners, which has been circulated among participants in the study, other key stakeholders and legal practitioners. This toolkit is available to download here and provides a suggested elder abuse screening tool for use by legal practitioners. The toolkit is intended to be a living document to be updated and expanded as new information and research becomes available. The project team is planning an official launch of the toolkit in Sydney later this month. On Friday 22 February 2019, Professor John Anderson presented on his current research arising out of the interdisciplinary ‘Action on Elder Abuse’ research project at a Newcastle Law Society CPD Seminar held in NeW Space. John presented on ‘Criminal Law and Elder Abuse’ as one of a panel presenting on Elder Law issues of ‘Capacity, Powers of Attorney, Elder Abuse and Criminal Law’. He spoke about the intersection of elder abuse with offences against the person in the criminal law using inquest case studies of physical and psychological harm, neglect, and incompetence in the care of elders. John challenged the large audience, substantially comprising legal practitioners, about avenues for reform and the pros and cons of specific ‘elder abuse’ offences in the context of the current Royal Commission into Aged Care Quality and Safety. The University of Newcastle and Greater Bank have announced a five-year partnership, uniting their combined strengths in education, banking, community engagement and regional focus, to deliver community education programs and practical facilities that support informed financial decision-making when managing money. The partnership includes the establishment of the Greater Bank Finance Lab, located on level one of the University’s city campus NeW Space, which is a dedicated teaching space equipped with 20 computers that will facilitate a hands-on, interactive environment that will promote learning in effective decision-making, economic systems, monetary markets and financial literacy. Conjoint Professor of Practice with the Faculty of Business and Law Kyle Loades was a joint recipient of the National Leadership Award for his work as a non-executive director of Credit Union Australia, Chair of Drive Yello, Chair of Hunter Medical Research Institute and Chairman of the NRMA, a role in which he led significant cultural and operational change. By his guidance, the NRMA became one of Australia’s foremost providers of transport and tourism services. Part of his strategy was to lobby on planning and policy, resulting in the NSW government legislation requiring petrol stations to provide real-time fuel prices, and the development of roads and transport infrastructure in NSW. Kyle has complemented his industry experience with continual professional development through formal education including: the completion of an MBA and a Graduate Certificate in Business Administration at UON, a Harvard Business School Certificate in Disruptive Strategy and participation in a Transformation Leadership Program at ANU. We are pleased to have such an accomplished alumni on board as the Faculty of Business and Law Conjoint Professor of Practice. The Faculty of Business and Law was host to the Australian Business Deans Council (ABDC) Learning and Teaching Network meeting. Assistant and Associate Deans of teaching and learning from around the country met to share ideas and innovations on topics including building student employability, implementing national disciplinary standards, and the future of business education. For the local showcase, Dr Kym Cowley and two student Peer Assisted Study Session (PASS) leaders presented on the innovative FBL PASS program; and Dr Elena Aydos presented on the cross-disciplinary EdEX course she and her colleagues have developed in Environmental Law. 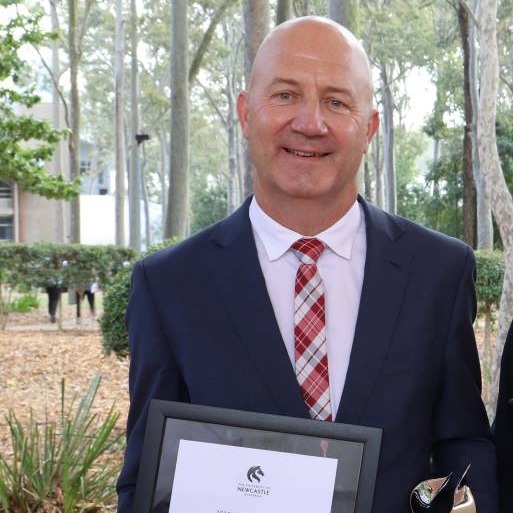 The self-made businessman and 2018 Alumni Awards finalist received the top honour at the 2018 Hunter Business Chamber awards. The Australian Government has awarded the University of Newcastle $1,267,750 million in funding under the 2019 New Colombo Plan Mobility Program. The Faculty of Business and Law has again been very successful in securing a number of these projects. These Short Term Mobility Projects enable our students to enhance their CV for greater employment opportunities after graduation as well as develop their cultural awareness and understanding of our neighbouring regions. Associate Professor Neil Foster was asked to give oral evidence before the Senate Education and Employment Committee’s Inquiry into the prevention, investigation and prosecution of industrial deaths in Australia. He attended the Committee hearing in Parliament House, Canberra, on Tuesday 7 August 2018, and spoke on the question of whether a company director should be able to obtain insurance against a criminal penalty imposed under workplace health and safety law. Video of his appearance can be seen here from 11:49:50, and a copy of his paper can be downloaded here. Professor Julia Connell recently represented the Faculty of Business and Law in India, facilitating six research development workshops for faculty members during Chandigarh University’s (CU) International Faculty Development Program from 9 July – 12 July 2018. Julia also met with female researchers from across the university to promote the creation of a Women Researchers network group. Julia has also facilitated a research workshop for 20 HDR students at IIT Delhi’s School of Management Studies before meeting with senior staff from the institution. Both Universities are important partners for the Faculty/UON and are keen to strengthen collaboration. In July, a group of 14 FBL undergraduate students undertook a two-week “industry-focused” study tour in China. They visited a total of eight significant enterprises in China’s energy and resource sectors, including those in steel making, iron ore and coal importing port, renewable energy equipment manufacturing, and e-waste recycling (circular economy). A majority of these organisations are heavily involved in the value chain across Australia and China. The visit to the Rizhao city has been featured in the local newspaper the Rizhao People's Society. The tour was led by Newcastle Business School’s Associate Professor Hao Tan and with support from Dr Patricia Johnson and UON PhD student Jintao Zhang. Dr Marcus Rodrigs accompanied 20 Newcastle Business School students to Singapore to be immersed in the local work culture and experience Singapore’s harmonious integration of ethnic groups. Their first industry visit was to Pest Busters who are Asia’s leading pest management company. The founder and CEO shared his insights on training and nurturing people to become leaders. The visit to Feinmetall put into the practice of theory they had learnt in classrooms and brought to light the many possibilities for making a business successful. The KPMG visit revealed what it was like working within a large multinational company where the emphasis was on developing both the technical skills and the soft skills of their employees. Students reported that this trip has opened up new possibilities for their career that they didn’t realise they were interested in until now, they have come back with a renewed energy for their studies, and a more confident attitude towards future goals. Twenty undergraduate and Juris Doctor law students from the University of Newcastle (UON) have recently returned from East Java in Indonesia as part of their International Study Experience course. The course focuses on the regulation of the social and environmental impact of business, and is run in collaboration with the Law Faculty of the University of Brawijaya (UB) in Malang, one of the top ten Universities in Indonesia. Law students from UB also participated in the program, and UoN students valued the opportunity to discuss with and learn from UB students. The students attended lectures by UB Professors on a range of topics, including regulation of palm oil plantations, corruption regulation and workers’ rights. The program included a range of field trips, including visits to a number of environmental and legal aid organisations, law firms, a reforestation project, and the state court. The students also visited one of Indonesia’s largest mining-related environmental disasters, a mud volcano that has devastated a significant area of East Java. UON students have been particularly interested to learn about the recognition of Adat law (which can be loosely translated as local customary law) within the Indonesian legal system. During the court visit, one of the judges discussed the concept of restorative justice, and the need for responses to crime to draw on local customs in order to focus on restoring harmony to a community, rather than simply punishing an offender. Restorative justice is actually a key interest of Newcastle Law School, and we are part of a project to turn Newcastle into a ‘restorative city’. The Newcastle Law School was honoured to host Professor Cristiane Derani from the Federal University of Santa Catarina, Brazil, during the Winter Term. Professor Derani is the Research Coordinator and Head of the research group on ‘Advanced Studies of Economics and Environment in International Law’ (EMAE) and a Researcher of the Brazilian National Research Agency (CNPq). Professor Derani is a member of the United Nations program Harmonia with Nature, member of the ELGA- Ecological Law and Governance Association, coordinator of the network of the new Latin American constitutionalism for the State of Santa Catarina and a fellow at the C-EENRG Research Centre at the University of Cambridge. Professor Derani was invited to inaugurate the International Environmental Law course, which is a core course under the new Master of Environmental Law. Newcastle Law School’s Dr Rita Matulionyte was invited to make a presentation in the Symposium on The Australia-European Free Trade Agreement: Intellectual Property, Innovation and Trade in the Age of Brexit, organized by Queensland University of Technology in Brisbane. She presented on the topic ‘Future EU-Australia FTA and copyright: what could we expect in the IP chapter?’ The Symposium was a great opportunity to enter the discussion on the future Australia-EU Free Trade Agreement, negotiations of which have now started. Following an initial discussion with 2NUR CEO Deborah Wright and Professor Tony Travaglione, NBS staff Julia Connell, John Dugas, Courtney Molloy and Phillip Morgan facilitated a number of workshops for 2NUR managers throughout July and August. Workshops included: change management, strategic marketing and planning; innovation, governance and risk management. One of the key goals for 2NUR is to engage more closely with the University of Newcastle and it is expected that academics, HDRs and others will be invited to share their stories on air very soon. Mr Shaun McCarthy from the Newcastle Law School along with Associate Professor Nola Ries (UTS) and Dr John Ward, Geriatrician, hosted a Capacity Assessment Symposium in conjunction with the Hunter Postgraduate Medical Institute and Hunter New England Health District at Noah's Hotel at Newcastle Beach. The 100 attendees included geriatricians, psychiatrists, nurses, GP’s, aged care assessment workers, speech pathologists, occupational therapists, mental health clinicians, social workers and lawyers. Alan Cameron, Chairperson of the NSW Law Reform Commission, was the keynote speaker who discussed the outcomes of the Commission’s recent report into the Review of the Guardianship Laws in NSW. The topics for the symposium included medical capacity assessment – methodology, issues and dangers, practical issues in capacity assessment and assisted decision making for older persons. On Friday 25 May, the University’s Chancellor Mr Paul Jeans and Vice-Chancellor Professor Caroline McMillen welcomed the Premier of NSW, Gladys Berejiklian and the NSW Minister for Education, Rob Stokes to officially launch the $95 million NeW Space facility. NeW Space was made possible by Australian Government funding of $30 million through the Education Investment Fund Regional Priorities Round, NSW Government funding of $25 million and $40 million invested by the University. The facility is tangible evidence of what can be achieved when important partnerships are established and nurtured. The building promotes contemporary teaching spaces, which reflect new ways of learning focused on collaboration and group work, as well as harnessing technology. Standard lecture theatres have been replaced with flexible working spaces and booth seating. Scattered throughout NeW Space are social spaces and facilities for engagement with industry, business and the community. That was the question asked to our university students by the newly formed Marketing External Advisory Board. Over 70 students from the Marketing and Tourism Discipline said yes! And enjoyed an evening with eight of Newcastle’s leading marketing professionals. Members of the board shared their experiences and donated prizes towards the evening. Two Faculty of Business and Law students have been awarded newly established Hunter Water scholarships, which offer financial assistance to help Indigenous students achieve their educational aspirations. Studying a Bachelor of Commerce, and in his first year, Jack Roberts received the Hunter Water Indigenous Scholarship which offers a total benefit of $22,500 over three years. Business student, Tahleigha Compton, was awarded the Hunter Water Indigenous Community Leadership Scholarship. The scholarship offers a benefit of $7,500 each year for up to three years to a student who is committed to making a difference in their community. Hunter Water also offers an annual Undergraduate Disability Scholarship, which was awarded to University of Newcastle combined Social Science and Law student, Joseph Popov. The Faculty would like to recognise the generous philanthropic support provided by Hunter Water for these scholars, which also includes paid on-the-job training that could open the doors to future employment opportunities. Over 100 women uon students, academics, professionals and entrepreneurs in business, finance and law attended the first in a series of events of the revised Empower Network for 2018. Attendees had the opportunity to hear about the career journey of Alumnus Rebecca Doyle who currently works as the Head of People and Culture at the National Rugby League (NRL). The Empower Network (formerly Lucy) aims to give women (at all stages of their career) the confidence and strength to navigate and manage their own career development. The Network provides a three-way connection between university students, industry professionals and high school students through a combination of face to face and online experiences and interactions. These connections are designed to inspire and inform young women about the study and career opportunities available in business, commerce, entrepreneurship and law, informing decisions regarding their work futures. A mobile app to enable farmers in rural Kenya to advertise and sell any daily surplus crops has won the 2018 Nairobi Young Entrepreneur Challenge, hosted by the Newcastle Business School.Aamir Pirani from the Aga Khan Academy won first place for his business plan innovation, collecting a $25,000 University of Newcastle study scholarship. Aamir’s ‘Soko phone’ app business plan enables low income customers to access cheaper farm produce by engaging directly with suppliers and features transaction capability through existing cellular money transfer apps. Aamir was one of four finalists selected to present their plans at the Australian High Commission in front of Australian’s High Commissioner for East Africa, Alison Chartres, and a panel of judges consisting of University of Newcastle’s Dr Patricia Johnson and two notable Nairobi business leaders. The Nairobi Young Entrepreneur Challenge is an initiative of Dr Michael Seamer of the Newcastle Business School and conducted in partnership with the University’s agent in Nairobi – Koala IAC. The competition is based on the NSW Year 11 Business Plan Challenge developed by Dr Seamer, which is now in its fifteenth year of competition. In June, Pro Vice-ChancellorProfessor Tony Travaglionetravelled to the University of Gadjah Mada (UGM) in Indonesia. UGM is one of the top four Universities in Indonesia and the first in Indonesia to be accredited by AACSB. Prof Travaglione met with the Dean of the Faculty of Business and Economics, Dr Eko Shivakumaran and Vice-Dean, Dr Mirulah Setyahadi to discuss opportunities for collaboration. These discussions resulted in the creation of a dual doctoral degree program. Prof Travaglione also visited Montclair State University and met with the Dean of the Feliciano School of Business to officially sign the MOU for a double degree for the MBA (Global) and the Master of Science (Data Analytics). In May, the Law School together with the Newcastle Law Society and Resolution Institute hosted Dr Richard Cornes, Senior Lecturer in public law at University of Essex, UK. Richard delivered a lecture on the psycho-social aspects of the dynamics of the courtroom. More than 50 staff, students and professionals, gathered for the presentation and Richard challenged their perceptions of the role of courtrooms as a social space using art and media. In June, the Empower Network was honoured to host Therese Rein for an exclusive event that provided 90 local high school students, university students and industry professionals the opportunity to learn about Therese's remarkable career journey. Therese is an entrepreneur who founded Ingeus from solo operator to serving over 500,000 people in over 12 countries. Therese shared an open question and answer session with local industry leader Jayne Drinkwater from the Greater Bank. The event was made possible due to the efforts of UON Alumni and Philanthropy and local businesswoman Shivani Gupta. Therese was in Newcastle to promote the work of Barefoot College. Inequality in Australia and the Hunter region was the subject of the HRF Centre’s economic breakfast in May. The event drew 230 guests from the community, government, and business sectors. Dr Anthea Bill, HRF Centre’s lead economist, revealed a trend of increasing inequality between Hunter neighbourhoods. Dr Bill examined disadvantage in the region based on location, education and family history. She also drew insight from the HRF Centre’s survey data - Wellbeing of Hunter residents. Melinda Cilento, CEO of the Committee for Economic Development of Australia (CEDA), discussed why growing inequality is being studied by leading economists around the world and released details of a new CEDA report -How unequal? Insights into inequality. Justice Martin’s lecture was open, honest and thought-provoking that provided a robust question and answer session with the audience. The Newcastle Law School celebrated the event with a dinner for Justice Martin and other distinguished members of the local legal community. HRF Centre’s Director, Professor Will Rifkin, has been leading a national discussion on the pursuit of a Cooperative Research Centre (CRC), or some similar construct, on regional development. The discussion is involving a national array of universities, industry partners, and state government departments. A key overarching topic has emerged – a need for ‘regional workforce solutions’. Elements of that focus include supply of labour, demand for labour, and aspects of wellbeing of the regional communities in which people live and work. The effort was launched in February 2018 when the Centre brought together a core group of leading academic researchers in Canberra. The initial response to developing this cooperative effort has been positive – from both leading researchers and selected partners in industry. Each member of the core group is now reaching out to potential industry and government stakeholders to identify their needs. The Newcastle Business School’s Prof Abul Shamsuddin and Dr Van Vu along with Dr Huu Duong from Monash University have been awarded a research grant of $5000 from Accounting and Finance Association of Australian and New Zealand (AFAANZ) to study the effect of an unexpected increase in bank deposits on bank lending activities to corporate borrowers. They will investigate the effect of the influx of deposits from oil and gas companies, following the shale boom in 2003, on (1) the amount of credit available to corporate borrowers, (2) the cost of borrowing and (3) bank monitoring. Using the shale boom in 2003 as an exogenous shock, they will employ the difference-in-difference approach to compare the features of bank loan contracts initiated by “affected” banks and “unaffected” banks, before and after 2003. The power of a genuine smile has been proven, with research from the University of Newcastle and Monash University showing a ‘genuine’ smile from a celebrity endorser can boost product likeability and even improve consumer attitude toward a celebrity whose reputation has taken a hit. Since, the research has been cited in two articles: The Perfect Smile to use in Advertising (2018, 7 May), B&T Magazine. and Don’t Fake it – a ‘Real’ Smile Boosts Celebrity Endorsements (2018, 7 May), Medianet. Stacey and Alicia were also interviewed by Paul Bevan during the Drive segment on 1233 ABC Newcastle in May.